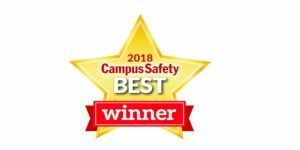 Singlewire Software, a leading emergency mass notification service provider, has received a Campus Safety BEST Award from Campus Safety Magazine. The program recognizes superlative security, law enforcement, emergency management and safety solutions for K-12 institutions, universities and healthcare organizations. Singlewire was recognized for its InformaCast Fusion solution in the Emergency Notification/Mass Notification Systems category. Entries were judged on aspects such as innovation, functionality, and benefits to the installer. “Campus Safety Magazine takes pride in focusing on content that helps protection professionals in the healthcare and education markets keep their students, teachers, patients, visitors, and campuses safe and secure,” says Robin Hattersley Gray, executive editor of Campus Safety.